Directly from Nashville TN these brilliant artists come to Blomberg for the second time ! Being nine years of age only Richard Smith was known as one of the most talented players in the american country and jazz music scene. He has the ability to transpose each kind of music immediately to his guitar. Without any effort he is approaching classical composers, changes to ragtime music, stop over on country and finally gets landed with exquisite jazz. 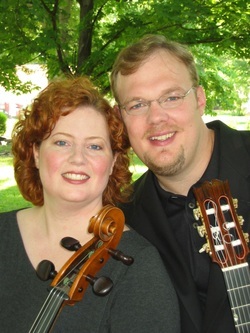 As done in August 2009 Richard Smith is accompanied by his wife Julie Adams on violoncello. Julie was being educated on her instrument at the respected CCM College - Conservatory of Music at the University of Cincinnati.